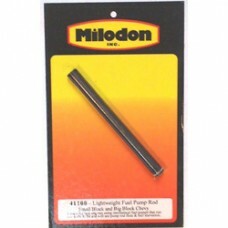 The Milodon lightweight fuel pump push rod is considered a must for Small and Big Block Chevrolet using mechanical fuel pumps in engines running over 6000 RPM. The weight of a stock pump rod can cause the pump arm to “float” resulting in fuel starvation. Heat-treated wear resistant ends, finished in black oxide. Designed for Small & Big Block Chevrolet.